If you want a dramatic and energising team building event that can be easily slotted into a large corporate occasion, then a team building drumming event would be perfect. By using percussion to bring everyone together and increase morale you are sending an incredibly powerful message about teamwork and company pride. Drumming is loud, but it also require precision and timing to ensure that it sounds good. Getting several hundred people to drum to the same beat at the same time shows just how easy it is to create something magical if they work together and really listen to one another. 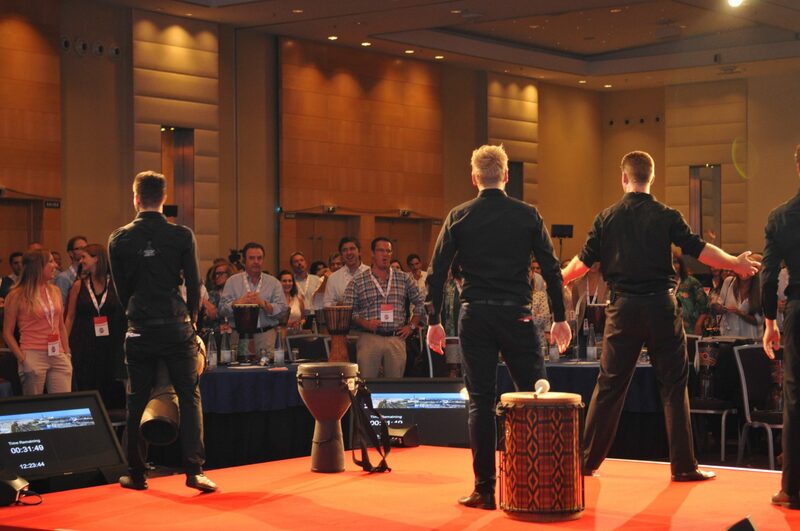 Drumming workshops offer a unique chance for a large group to understand company cohesion and because they are so engaging, they will be thoroughly enjoyed by everyone. They help to foster good leadership skills and require people to hone their listening skills if they are to create the right sound. However, you don’t even need to have a drum! Team building drumming can be used in different ways. Our Junk Funk team building event uses all sorts of different objects to create a sound. From brooms to pipes to dustbin lids, the inventiveness and how you play the new musical instruments is entirely down to your team. For a quick blast of morale raising euphoria, our Body Percussion is a short team building activities that works brilliantly as an conference energiser. No equipment is necessary, which makes it ideal for large corporate events, all you need to make an amazing amount of noise is to be able to clap, stamp your feet and generally follow and keep up with everyone else. If you'd like to find more about how effective team building drumming events are or more information on our many different team building activities, then please give us a call on 0800 083 1172 and we'd love to help you!